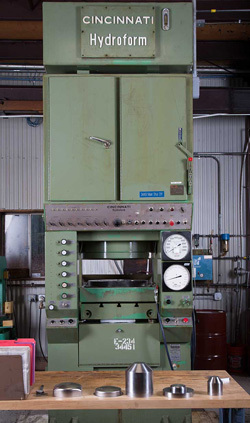 MuShield’s 12 inch Cincinnati Hydroform Press produces precision formed sheet metal parts. The Hydroform process utilizes a mandrel machined to the inner dimensions of the formed sheet metal part as a forming punch. Hydraulic pressure (up to 15,000 psi) behind a specialized rubber diaphragm provides the force required to wrap sheet metal material onto the punch as drawing force and motion is applied. Both simple and complex sheet metal shapes can be produced using the hydroform process. Tooling cost is minimized as usually only one mandrel is required. Formed sheet metal components have no weld seams yielding superior components.